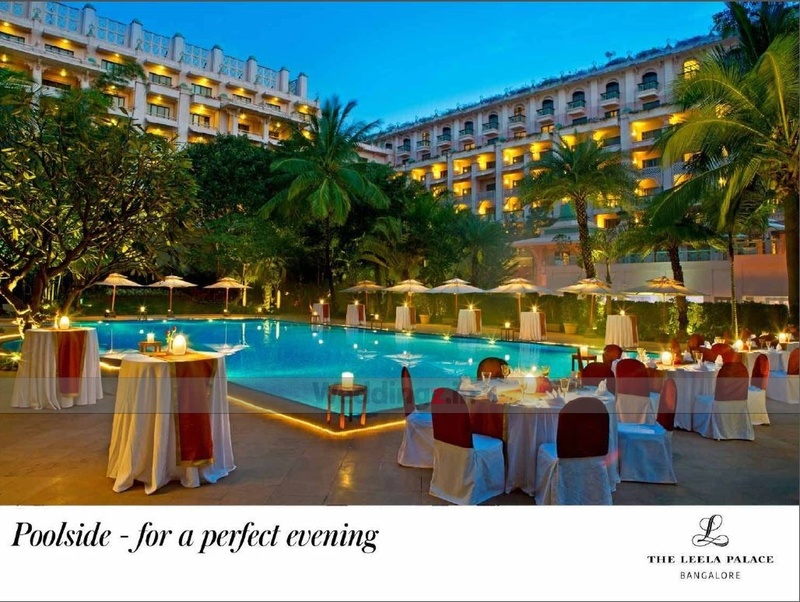 Leela Palace, Bengaluru, is spread over almost 9 acres of land and surrounded by cascading waterfalls and ornate blooms. 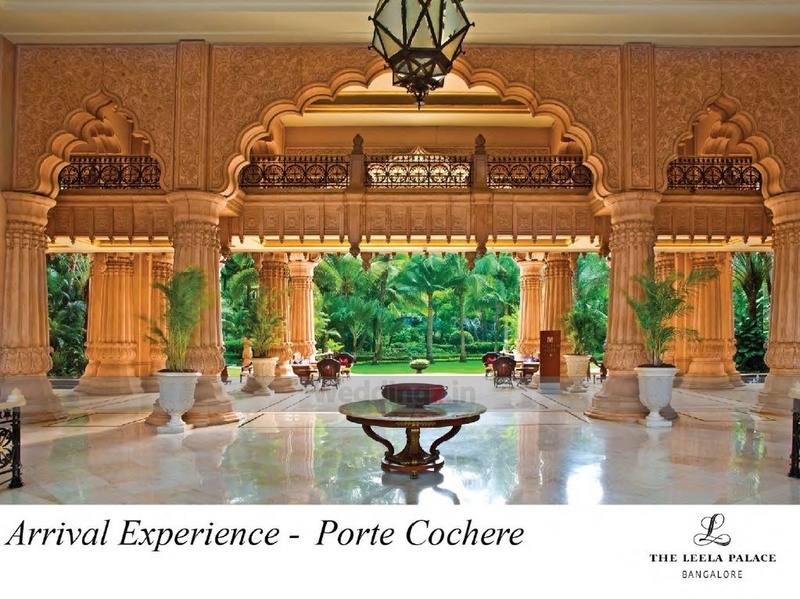 It’s situated strategically near the airport and contains a rich blend of modern architecture and luxury. The venue will celebrate your wedding, reception or engagement in an unforgettable style with in-house professional expertise and provide unbelievable comfort with latest facilities on their site. You can have your first dance with your significant other at the Royal Ballroom or put up a nice show at the Grand Ballroom. Kamal and Sitara are two excellent party venues for your guests to unwind at your wedding. You can also hit the pool area and just have a nice time. 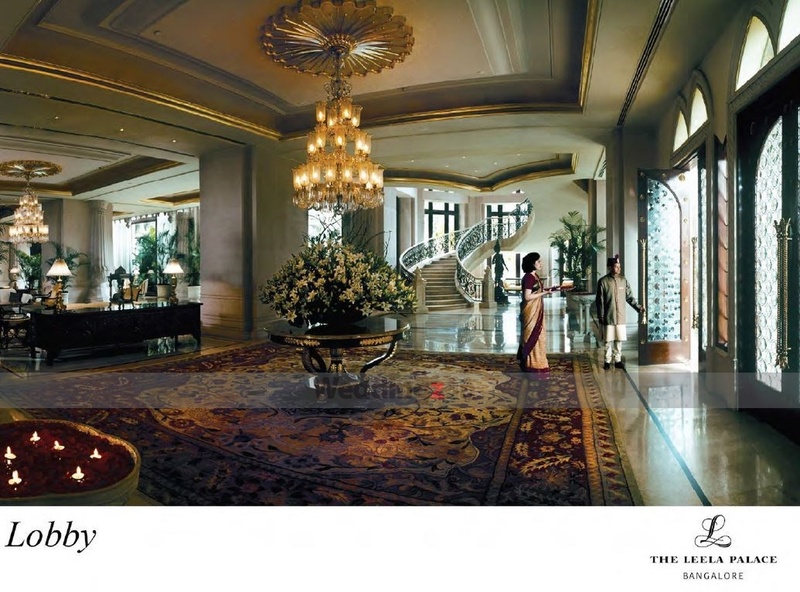 The The Leela Palace located in Kodihalli, Bangalore has Wedding Hotels, Cocktail Venues, Banquet Halls and 5 Star Wedding Hotels. 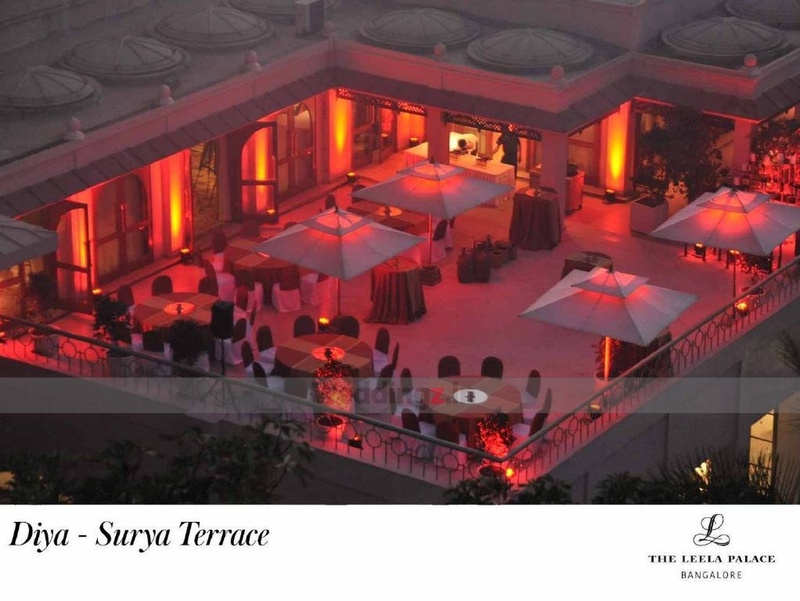 Diya Terrace can accommodate upto 100 guests in seating and 150 guests in floating. Nithya can accommodate upto 70 guests in seating and 150 guests in floating. Poolside can accommodate upto 50 guests in seating and 100 guests in floating. Sitara can accommodate upto 60 guests in seating and 80 guests in floating. Kamal can accommodate upto 60 guests in seating and 80 guests in floating. 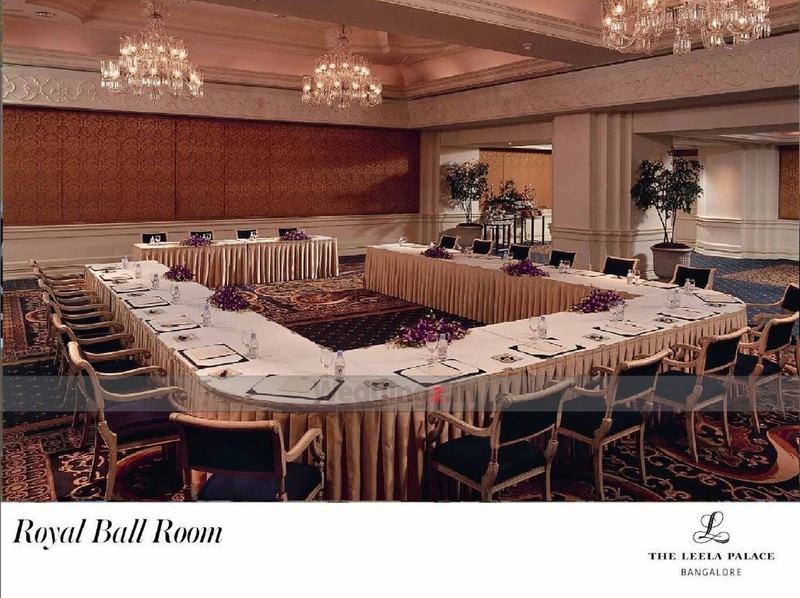 Royal Ballroom can accommodate upto 200 guests in seating and 300 guests in floating. 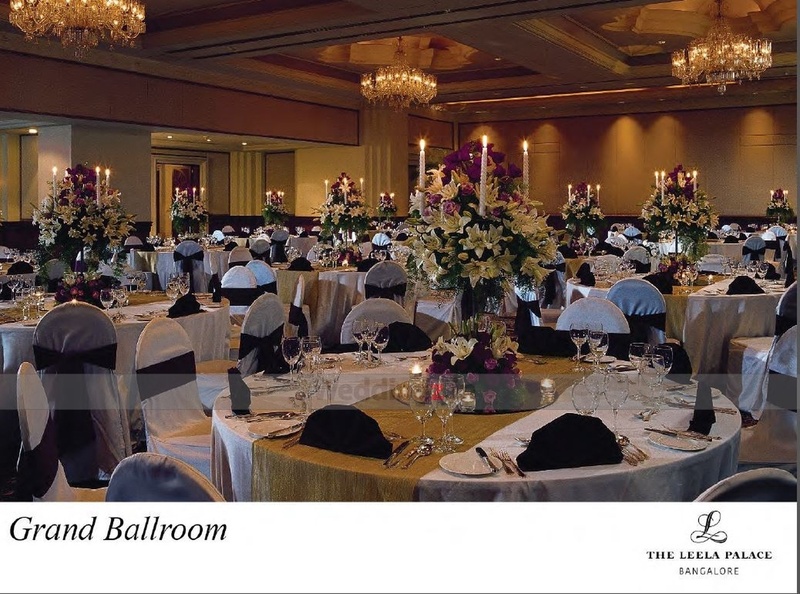 Grand Ballroom can accommodate upto 600 guests in seating and 900 guests in floating. Vegetarian and Non Vegetarian food is served at this venue. 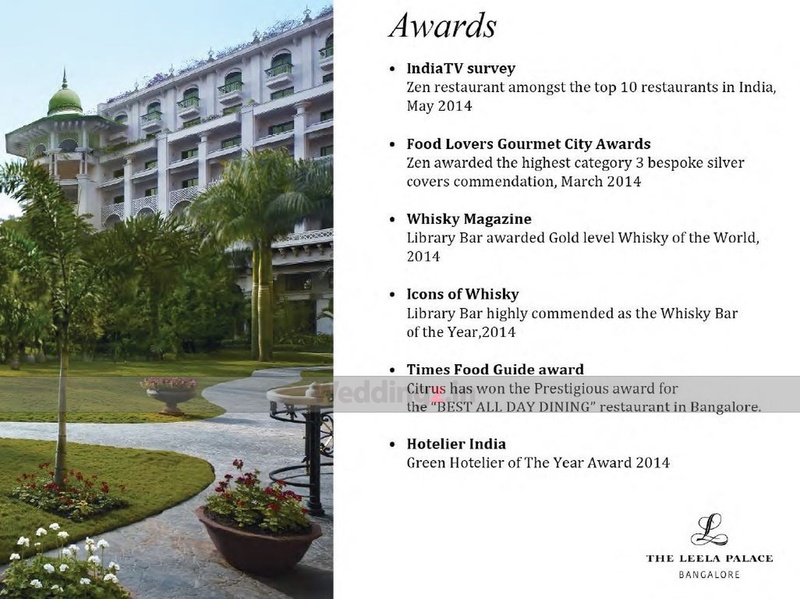 Features of this wedding venues are : Food provided by the venue , Non-Veg allowed at the venue , Alcohol allowed at the venue , Halls are air Conditioned , Ample parking , Baarat allowed , Hawan allowed , Decor provided by the venue , Packages starts at Rs 2500 per plate for vegetarian menu and at Rs 2500 for non veg menu.